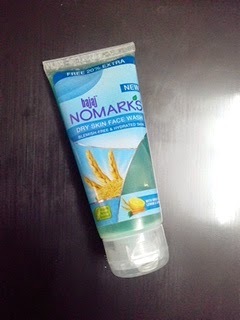 I have already done Nomarks Soap review in my last post and this one is about the Nomarks Face Wash for Dry Skin. Similar to other Nomarks Products for Dry Skin, this facial cleanser too comes in a blue colored packaging. This face wash is specially meant for dry pigmented skin with blemishes and so I gave this one to my mother to try this on her slightly pigmented skin. Along with the Nomarks Soap and Cream, she have been using this face wash since few weeks and here is what she experienced with this moisturizing facial Cleanser. Nomarks Neem Face Wash, facial Cleanser for dry skin, for all skin types and Nomarks Face Wash for Oily Skin. With age, skin tends to become dry due to the loss of natural hydration and becomes prone to blemishes and wrinkles.New Bajaj Nomarks Face Wash for Dry Skin is formulated with encapsulated beads of Carrot, Lemon and Wheat Germ Oil that not only help in hydrating and nourishing your dry skin, but also provide sun protection from the harmful effects of UVA & UVB rays. Regular usage helps prevent darkening of skin and keeps it free of blemishes. Carrot oil prevents skin aging. Lemon is an effective skin cleanser. Wheat germ oil reduces wrinkles and nourishes the skin. For best results, apply Nomarks Face Wash all over the wet face in a circular motion. Wash off & pat dry. Ingredients: Carrot, Lemon and Wheatgerm Oil. 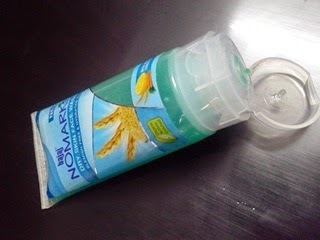 This face wash from Nomarks comes in a nice cute looking blue transparent tube with a flip top similar to most of the facial Cleansers. The fragrance of this is also citrus & refreshing pretty similar to the the one in the soap. 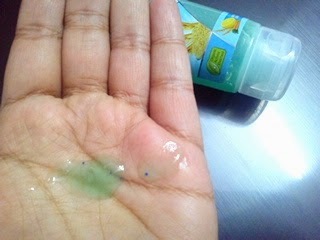 The face wash looks like a transparent gel with a green tint with minute yellow beads for gentle skin exfoliation. I took a very little amount of this Cleanser on my hands and rubbed it on my hands using few drops of water to form lather but surprisingly it lathered very less than expected. It could be because it's for dry skin and more lather could make skin even more drier. Anyways I went ahead to clean my face with it and it felt very gentle, not at all harsh on the skin. The exfoliation process was just average not enough required for removal of dull rough skin. One can look for other exfoliating face wash if they want really nice exfoliation. But I was quite impressed the way it left nice fresh looking skin with a subtle glow. My MA don't really have rough dry skin but tiny pigments here and there and this face wash immediately resulted into brighter looking skin with faded blemishes and scars. I must clear here, the effect of the lightened scars was only for few minutes after wash and then they appeared normal like before. This could be because of the instant fresh glowing skin which we feel immediately after rinse. In long term, I feel the cleanser helped somewhat in skin whitening. Yes my mother has a dusky complexion which has improved a little with usage of this cleanser over few weeks. Along with these her scars & blemishes look faded now and not that dark like the way they were before. So I think this Nomarks Face Wash is nice cleansing gel for people with dry skin prone to pigments and blemishes. Comes in nice friendly tube packaging with a flip. The tube looks cute being transparent. Nicely clean skin with gentle exfoliation. No drying or stretching of skin. Scars look faded with regular usage. Not huge reduction in scars & blemishes as claimed.